So yeah, as I may or may not have mentioned here before, the plain-old RWS has never really been my thing. 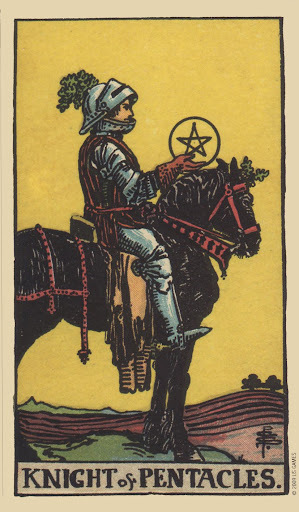 My first ever deck was the Universal Waite, and although it was quite useful in teaching me the basics of the system, I had quite a few issues with the imagery. I gave it away as soon as I procured my second deck and never really looked back. Until quite recently, that is. Things coming full-circle I suppose. The PCS Commemorative seemed like such a nice take on the deck - not too yellow, nicely aged-looking, great extras in the kit - that eventually I couldn't resist. This week I decided to finally take the plunge and work with it. So far, I am finding it not unlike this card, which I drew early this morning. A work-horse of a deck. Nothing super special, no incredibly deep connection or intense plumbing of my sub-conscious but...clear, concise readings that really get the point across very well. A certain bluntness that I rather appreciate. There's no long staring into the details of the cards here...the answer is there. I can see why a lot of people seem to see the 'classic' decks like RWS as best for reading for others. But yeah, I've done 3-4 readings for myself, and they have been spot and and to the point and very useful, overall. The cardstock, while definitely not the best of all my decks, is definitely nice by contemporary USG standards; it has a waxy feel I quite enjoy. I definitely like the colors, and the art style in general - it definitely works much better for me than the Universal Waite ever could. Looking forward to the rest of my week with the deck. To me, worth the purchase, especially with very nice Pamela Coleman Smith extras that come with. As for the actual draw: had an exam today, which I actually just got done with. I suppose, even when in the grand scheme of things the stakes aren't all that high, there is always some apprehension for me with exams. The perfectionist in me or whatnot. This card reminds me that I already have been doing everything I really could be - working hard in class, studying outside of it, writing and re-writing vocabulary to try to memorize, really TRYING and doing the WORK necessary to learn; that's really the best I can do. If it pays off and I do well on the exam, great. If I do a bit less well (and with the work I've done, I don't really think FAILURE is really likely) well, then at least I'll know what I need to focus on in the coming weeks. The goal is not numbers on a piece of paper but rather knowledge in my head. Keeping at it in terms of doing the actual work will get me there, eventually.